A friend sent a link to a story on PBS News Hour about a man named Adam Gorlitsky. Apparently Mr. Gorlitsky was paralyzed ten years ago. A cross county runner in high school, Gorlitsky has been using ReWalk exoskeleton for a few months. His goal was to participate in the Cooper River Bridge Run in Charleston South Carolina. The spin of the story is dreadful. Even the title of the PBS story is objectionable: "How Robotics helped a paralyzed man cross the finish line". Link: http://www.pbs.org/newshour/bb/how-robotics-helped-a-paralyzed-man-cross-the-finish-line/ I often see similar stories in local newspapers. They never deviate. A young man or woman is paralyzed. Preferably they have an athletic background to highlight the perceived tragic nature of a spinal cord injury. Despite great odds, impossible odds really, the young person "overcomes" their spinal cord injury by walking a set distance. Tears flow forth as a super human effort is made to "walk" across a finish line. The finish line can be a race, wedding, graduation ceremony or other notable event. This is merely a variation on a theme. We are supposed to be inspired. I have no doubt bipedal people are inspired. The logic is not complex or subtle: it is assumed all paralyzed people spend a great deal of their time and energy trying to walk. The fact this assumption is utterly false is conveniently overlooked by the mainstream media in its quest for readers and ratings. In short, the puff piece is effective click bait. My thoughts are at odds with stereotyped notions associated with a paralyzing injury. Like almost all the other paralyzed people I have met in the last 35 years, none of us have any interest in walking. On occasion I will wish my injury was lower but walking is no longer relevant to me. It is simply not a thought I ever entertain. Walking as a thing has not been of interest for over three decades. Again, like all those I know who are paralyzed we simply move on with life. We are anonymous. You will not read about us in the news because we are simply content to lead an ordinary life. In our place outliers like Mr. Gorlitsky make headlines. Media portrayals of the paralyzed walking via the exoskeleton are misleading and destructive. Here I am not chastising Mr. Gorlitsky. Insert any name in his place. The narrative is consistent: hero overcomes paralysis and walks. The PBS News Hour story is 90 seconds of feel good propaganda. ADAM GORLITSKY: My wrists, man, my wrists feel like they’re about to snap in half. JUDY WOODRUFF: And seven hours after his journey began, the man who was once told he’d never walk again finally crossed the finish line. ADAM GORLITSKY: It feels really good. It feels really good. I’m speechless, man. I really am. JUDY WOODRUFF: What an inspiration. This historic event is a testament to the quality of cutting-edge technology offered at Roper Rehabilitation Hospital, the only CARF-accredited spinal cord injury program in the Lowcountry, said Cathy Therrell, director of Roper Rehabilitation Hospital. “We are so proud of Adam and we are thrilled to be the first to offer ReWalk to persons with spinal cord injuries in South Carolina,” Therrell said. Adam, 29, fell asleep while driving December 30, 2005, which led to a car accident that severed his spinal cord at the T9 level, permanently paralyzing him from the waist down. In 2015, Adam was introduced to the ReWalk exoskeleton at Roper Rehabilitation Hospital, located inside Roper Hospital in downtown Charleston. Over the course of five months, he has nearly completed his training on the ReWalk and will finalize his training with his own personal system. Adam led a successful crowdfunding campaign on his website I Got Legs, which will pay for his ReWalk system. Once his training is complete, Adam will be able to use the ReWalk to stand, walk and return to many activities he once did every day. Let me put my own spin on the above. ReWalk is at the forefront of branding its version of the exoskeleton. ReWalk is a for profit corporation medical device company whose stock sells on Nasdaq (RWLK). It has locations all over the globe. ReWalk is not a charity. They are in the business of making money. Roper Rehabilitation where Mr. Gorlitsky trains two to four hours a day is like other rehabilitation centers nationwide that market the ReWalk brand name. The ReWalk for those who suddenly find themselves paralyzed is appealing. I get this. The human body was not designed to be paralyzed. Glossy hospital magazines with the photograph on the cover of a smiling young person "walking" in the ReWalk will attract patients. ReWalk and the rehabilitation center are proud of Mr. Gorlitsky. Proud they should be as he is the poster child for the marketing campaign to sell these devices. However they are not proud enough to give him a ReWalk. He started his own crowd funding campaign to raise money and multiple news stories have appeared about him. The feel good story on PBS neglected to mention any of this. Nor did the PBS story note the price of the ReWalk device: $77,000. The sticker price for the ReWalk version of the exoskeleton is well beyond the means of virtually all paralyzed people. I wish Mr. Gorlitsky well. I am sure he is a good man. My words are not in any way a criticism of his effort. Instead I object to the spin used in various videos and local newspaper stories about him. What I did not read was anything beyond how he injured his spinal cord and how he wants to walk. An effort that ReWalk states will enable him to stand walk, and do many activities he once did daily. Can he not do this using a wheelchair? I expect to get a lot more bang for my buck when talking about $77,000. 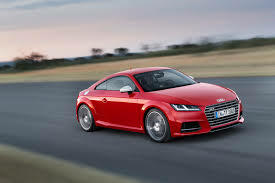 I could buy an Audi TTS pictured below and still be able to put over $10,000 in my pocket. My point is that modern day rehabilitation has lost its soul and big business is making a profit selling paralyzed people a false set of goods. People should not be used for inspiration and be cheered on in a misguided attempt to walk. The symbolism involved in such an effort alone is destructive. A wheelchair is a powerful way to navigate the world. A wheelchair is life altering technology. Walking is not the only means of navigating the world. We should empower people who experience a spinal cord injury and not profit off their injury. This was exactly what Ed Roberts had in mind. I value the utility of cripple power. I revel its warm embrace.